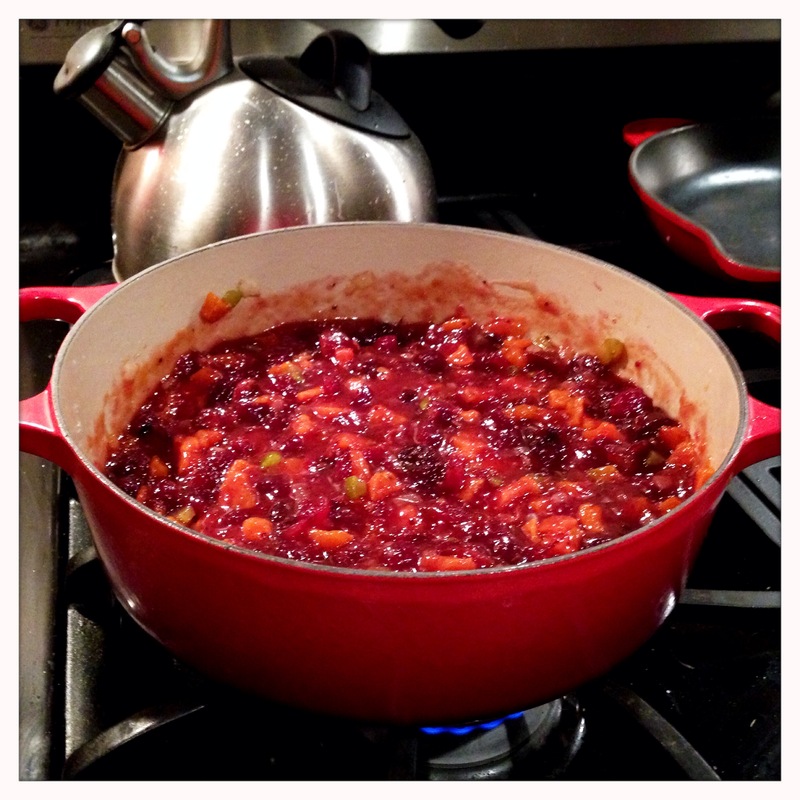 Cranberry sauce is a holiday staple. It doesn’t seem to make many appearances outside of the holiday season, and that is really kind of sad. 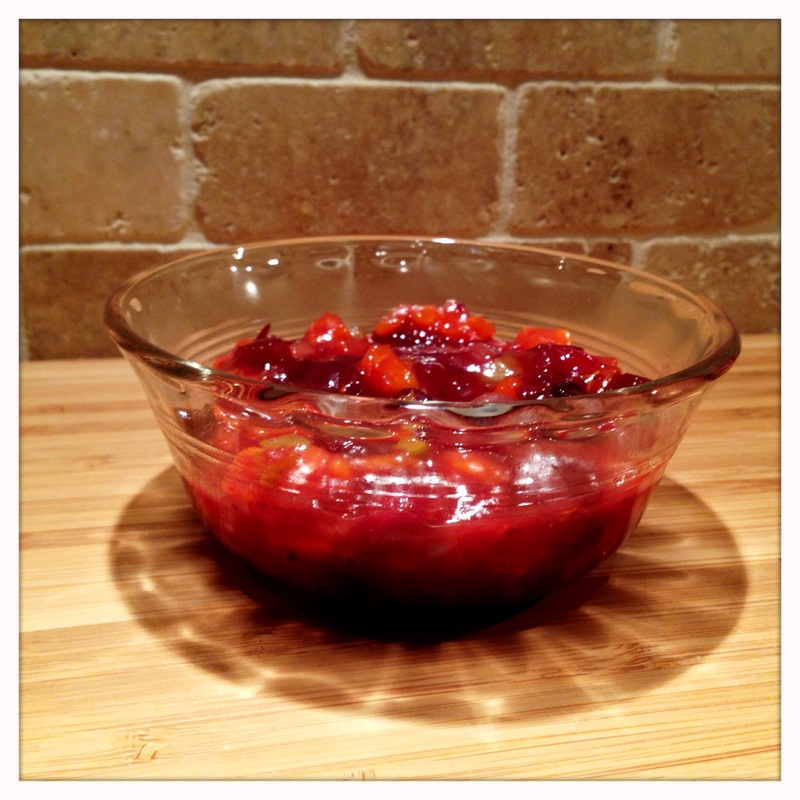 This is a post about Christmas dinner, and this cranberry sauce is a perfect side for any meal. The sweet fruit will appeal to your youngest eaters, and the tartness mated to familiar holiday spices will make everyone smile. While it would be nice to start completely from scratch, this recipe uses canned cranberry sauce along with additional ingredients to give a fresh and unique flavor. The canned sauce is a traditional flavor everyone will enjoy, and it’s a great time saver not starting from scratch with raw cranberries. So, let’s get started. 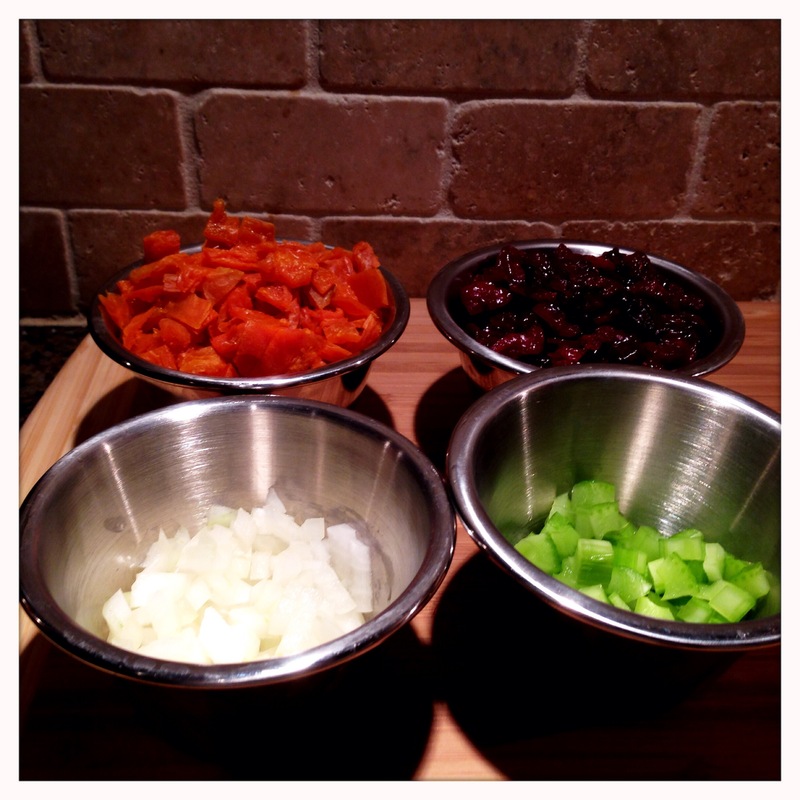 Finely dice your onion and celery. It doesn’t need to be minced, but you want fairly small pieces. These aromatic vegetables are being used to add flavor, but no one wants a big chunk of celery in their cranberry relish. The dried cherries can be left whole, but you’ll want to chop the apricots. I used the size of the cherries as a rough guide for chopping the apricots. 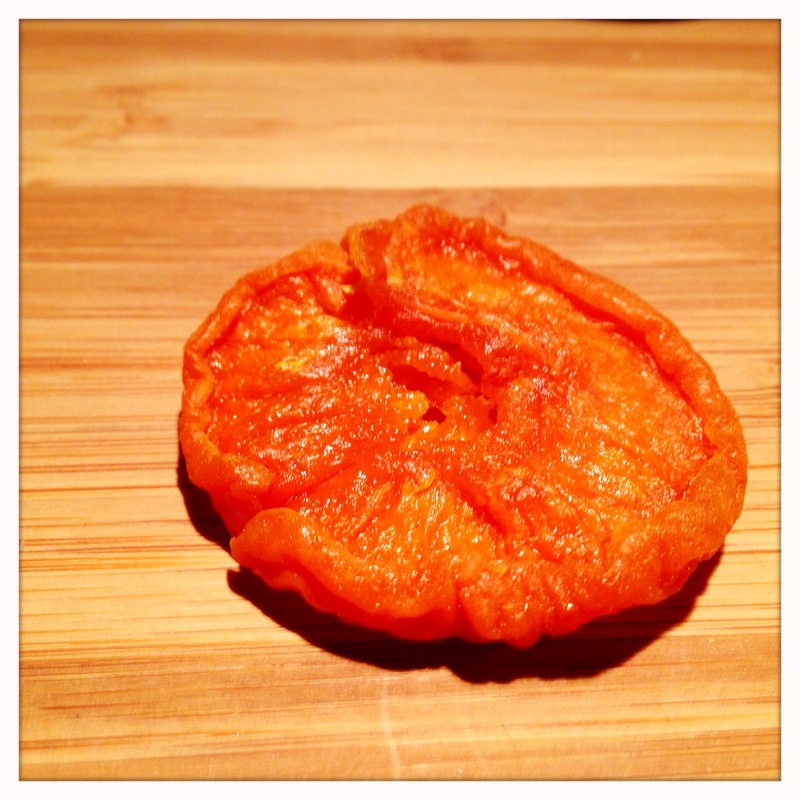 Of note, I used slab apricots rather than the Turkish apricots. Slab apricots, sometimes called California style apricots, have a much more intense apricot flavor. They are more tart than the Turkish apricots, but also have a much fresher flavor, which will help them cut through the other flavors in this relish. In a heavy pan, heat some butter. If you’re not used to cooking with butter, it’ll start to bubble as it melts. You’re ready to cook when the bubbling dies down, which means the water in the butter has boiled off. Be careful not to burn the butter, but try to wait to add anything to the pan until the bubbling is done. 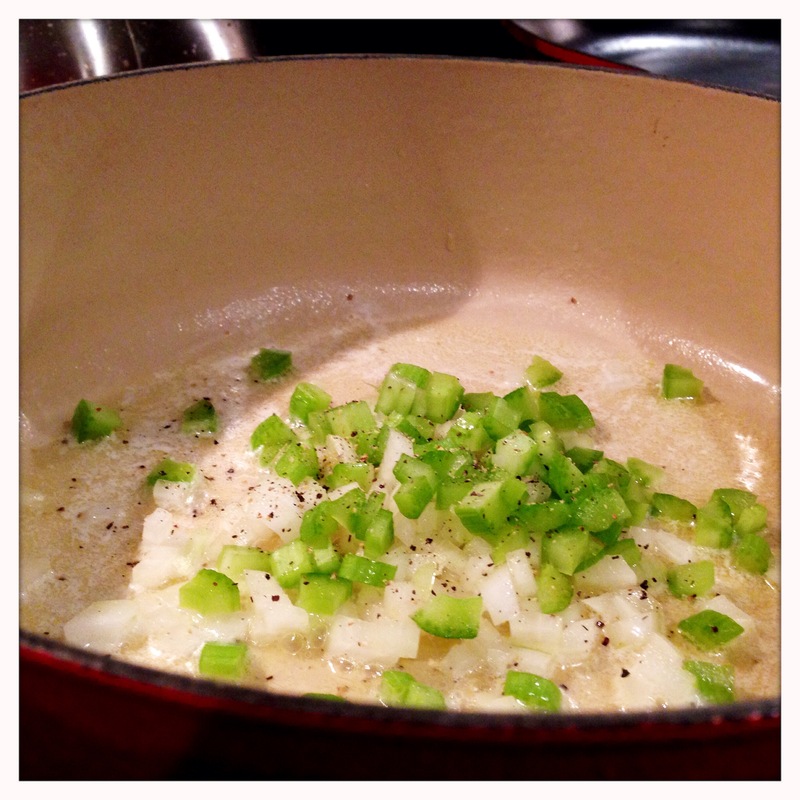 Once the butter is ready, add the onion and celery. Season with a few grinds of pepper, and saute until the onion and celery soften. 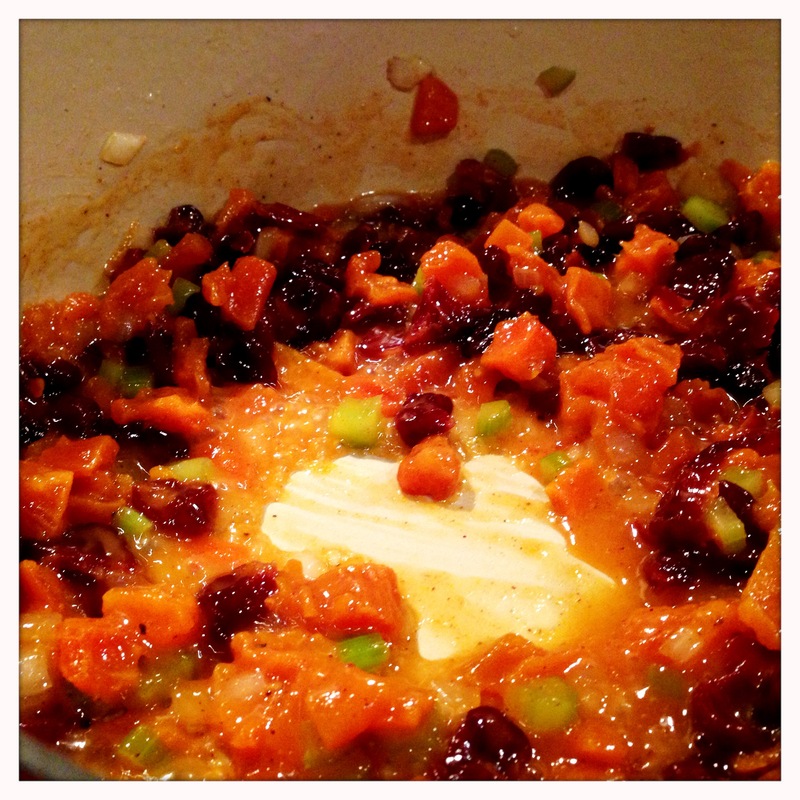 Add the apricots and cherries. Season with a few shakes of cinnamon and nutmeg. Cook the fruit for a few minutes with the onion and celery, and then add the orange juice. Stirring continuously, cook for several minutes until the juice reduces to a syrupy consistency. Once the juice has gotten syrupy and the kitchen is smelling amazing, add the cranberry sauce. 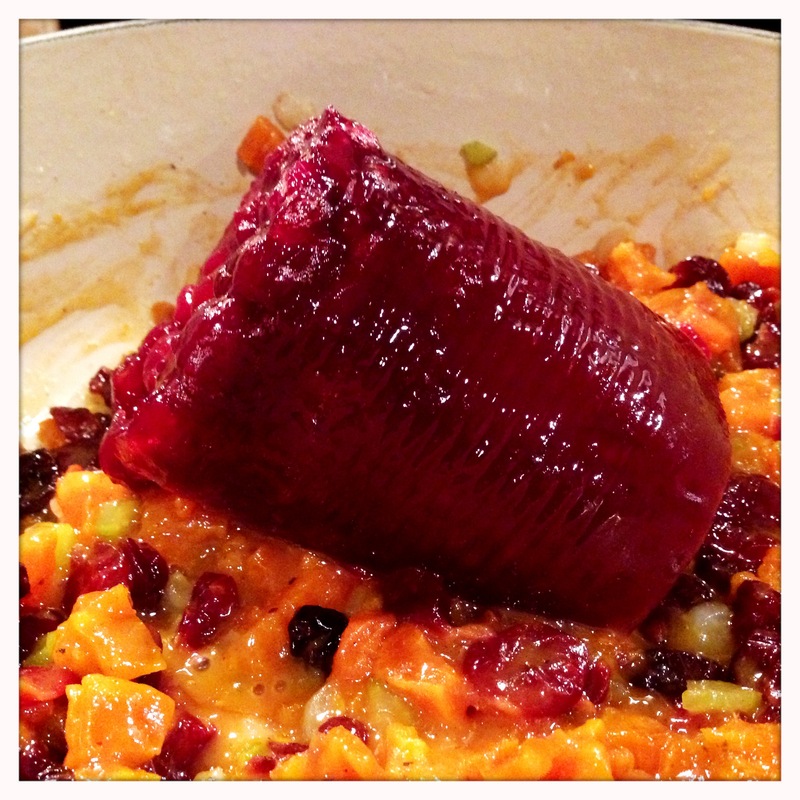 I know multiple people who feel a holiday isn’t complete without a can-shaped blob of cranberry sauce… So, here it is! 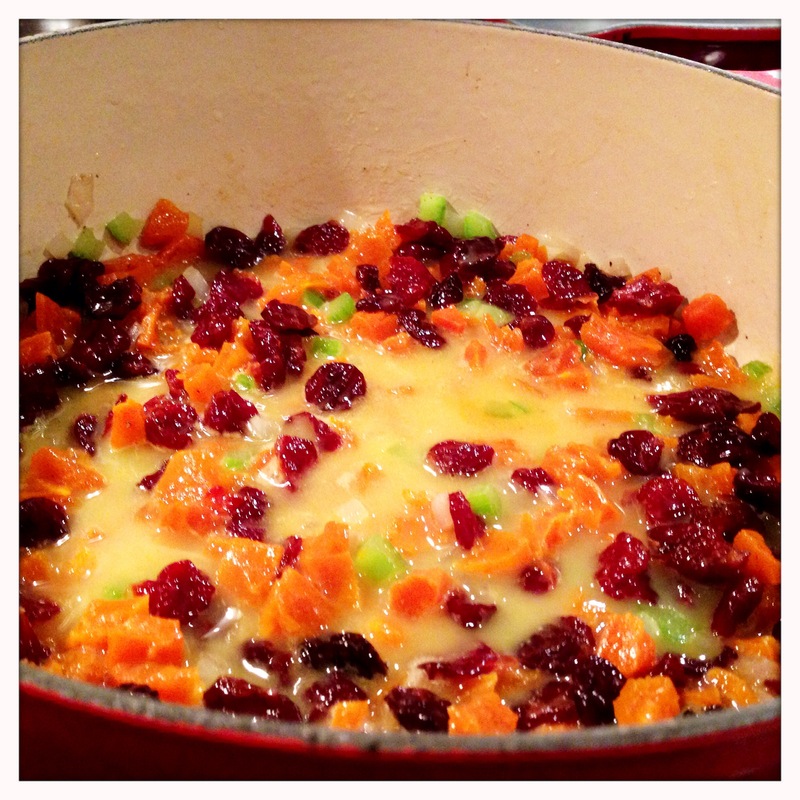 Stir in the two cans of cranberry sauce. Add the maple syrup and stir to combine. Continue to simmer over a medium or medium-low flame for at least 15 minutes. Taste the relish, and adjust the seasoning to taste. If it’s too tart, add a little more maple syrup. I added a little extra nutmeg and cinnamon to punch up the “holiday” flavor. After making any seasoning adjustments, simmer for another 5 minutes minimum to allow the flavors to mingle. This keeps well in the fridge, making it an ideal recipe to make a few days in advance and free up some time on the big day to work on other dishes. I wanted some more, too. But, in the holiday spirit, we put the rest in the fridge to share with family on Christmas Day. Give this recipe a try, and add a little homemade touch to a canned holiday staple – and Enjoy!